With an interesting mosaic of habitats on rich floodplain wetlands, back channels, beaver ponds, and oxbow lakes, this park contains a pristine delta area suited to nature study, wildlife viewing, fishing and hunting. Please bring your own campstoves for cooking as campfires are not permitted in the park unless for an emergency. If a fire is used for an emergency, please keep it small and ensure it is completely out before you leave. There are no developed trails in the park. On the east end of Mud Lake, due east of Blue River and 230 km north of Kamloops on Highway #5; the park is accessible by boat via the North Thompson and Mud Rivers. There is an active logging road that can be used to access portions of the Park. History - Established April 30, 1996. Conservation - The park encompasses a mosaic of habitats which include floodplain wetlands, back channels, beaver ponds, small oxbow cut-offs (lakes), cottonwoods and sedge meadows. It shows early successional stages on delta formations, with old-growth mixed cedar/hemlock/spruce on steep slopes on both sides. Wildlife - Important bull trout spawning and possible coho salmon spawning and rearing. Excellent moose calving and year-round habitat; could be spring grizzly range. A canoe or kayak is required to access this area. 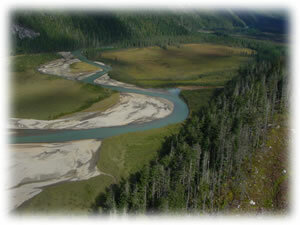 Access is from the north end of Blue River, along the North Thompson and up Mud River to the Lake. There are ice fishing opportunities in this park. You are responsible for behaviour of pets and domestic animals and must dispose of their excrement. Backcountry areas are not suitable for dogs or other pets due to wildlife issues and the potential for problems with bears. A pristine delta area for nature study and wildlife viewing. Snowshoeing is permitted. No maintained trails.